I met Tiffany and Mike through our mutual friend Crystal when we were all in college at UNCW. Mike reached out to me when he was planning to propose to Tiffany downtown along the waterfront in Wilmington, and I am so glad he did! We were able to photograph their proposal, engagement photos and of course their beautiful wedding at The Barn at Rock Creek. I absolutely love photographing at the Barn at Rock Creek, the property is gorgeous, the barn itself is modern while still providing that rustic feel, and Lesley is a dream to work with. Tiffany and Mike were married in the beginning of April, and we had a perfect day for a spring wedding. The temperatures hovered around 70 while the sun shone brightly out. The trees that surround the property provided shade for the ceremony, but the sun still provided a beautiful back light that was streaming through the trees. 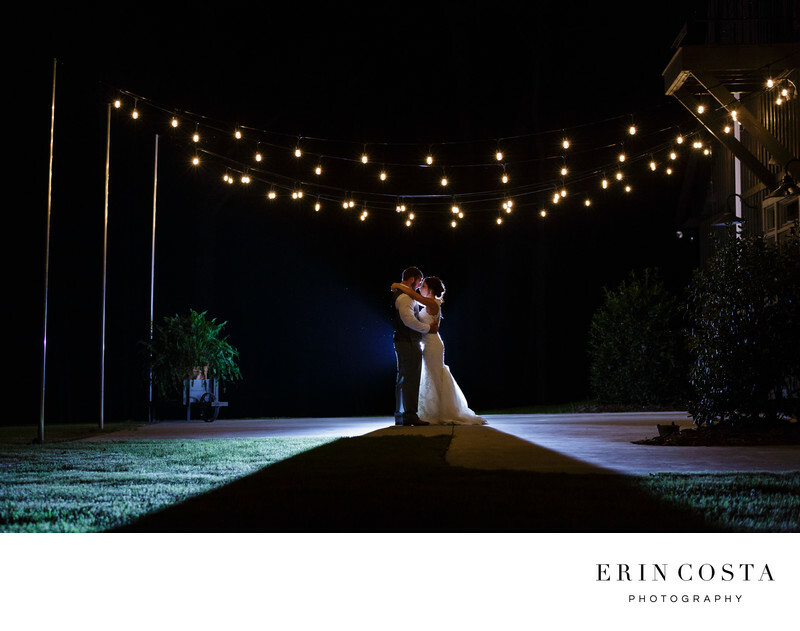 During the day when I walking the property before the wedding festivities got started, I spotted these lights on the patio and instantly knew I had to take a photo here once the sun went down. Guests were mingling around outside during the evening, but I knew Tiffany wanted this photo, so we moved everyone inside, moved some cocktail tables and set up this photo. It has instantly become one of my favorites from their wedding day. Location: 5900 Rock Creek Rd NE, NE Leland, NC 28451.